A constraint satisfaction problem is defined by a set of variables associated to domains,and a set of constraints on these variables. 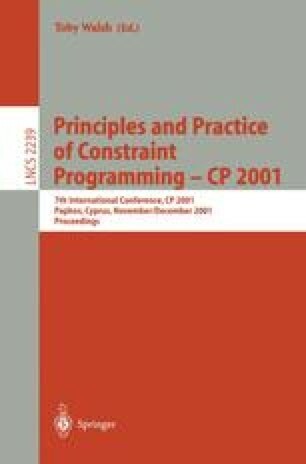 Solving a constraint satisfaction problem consists in finding assignments of all variables that satisfy all constraints. Since this problem is NP-hard,constraint propagation has been designed to struggle against the combinatorial explosion of brute-force search by pruning domains before enumeration. Filtering algorithms enforcing consistency properties are the most well-known techniques for constraint propagation. This work is supported b the COCONUT IST european project.